← The subway system as art. Well, Yes and no. As it turns out there are things that this city just doesn’t offer – at least not in bulk. Take Big Red for instance. A soda with it’s roots in Texas that just doesn’t seem to be sold widely on the East coast. 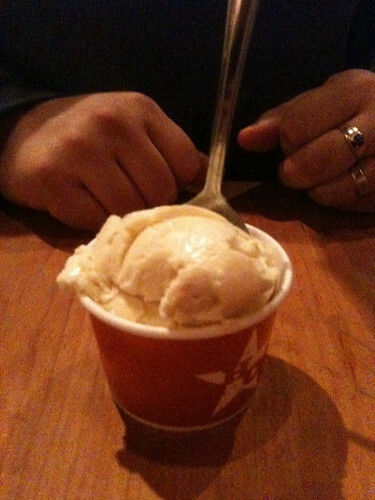 We have found it here though at Hill Country BBQ – a place that also sells Blue Bell ice cream, another Texas original. But when we go there Paul can only get one or two bottles at a time and they are always bottles – it’s more kitsch than function. The blue bell is sold in tiny scoops – not the giant mounds one longs for (OK, so in reality, I don’t long for ice cream and if I’m craving it, a spoonful will do but in general when you order the ice cream and get the scoop it looks a little disappointing.) I digress. Blue Bell Ice Cream at Hill Country BBQ on one of our most recent visits. With Paul’s birthday coming up I went online and ordered 3 – 24 packs. It sounded like a lot less when I was at my computer than when 2 giant boxes actually arrived at our building, one weighing in at over 48lbs! There was no way I was going to be able to hide these massive boxes in our apartment so I enlisted our doorman’s help in opening them and getting each 12 pack out. They were nestled deep within the protection of packing peanuts and bubble wrap, I had to dig to find them. When I finally got each one settled into my little grocery cart I crossed my fingers that the cart could handle the weight and made my way up the elevator. There was at least one comment from a fellow renter at my obvious LOVE of Big Red. Is it wrong that I felt the need to explain myself? 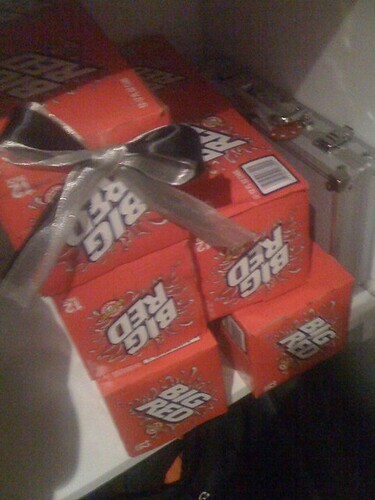 “Oh no, I don’t drink soda – it’s for my husband, his birthday, uh, we’re from Texas you see, they don’t sell this here, and…oh my floor.” Alas, it was all worth it. Although Big Red may not be filling my local bodega’s shelves it’s only a click away – so in the end New York does have everything, doesn’t it? This entry was posted in everything i've blogged, food and tagged delivery, dining out, Holidays. Bookmark the permalink.